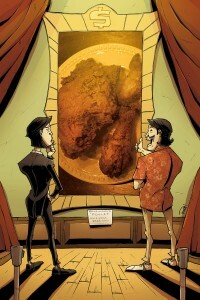 Chew #26: The introduction to the real Toni Chu! Up until now we have known quite well that Tony has a twin sister whose name is also Toni, but, with the ‘i’, did you catch that? (Don’t worry, their parents didn’t do that to be cruel. Her name is Antonelle in full, but like most she goes by a diminutive version of.) What we didn’t know up until now, despite the strong hints pointing directly at it in the pre-released #27, is that she also has strange powers that, much like her personality, are the exact opposite to those of Tony. Yes, I’m talking about biting live creatures and seeing their future – Cibovoyant, if you wanna be fancy. She’ll bite lovers, family, friends and lick paintings if it means she’s helping someone out, even if sometimes that someone is her. She is the warm hearted, level headed, dependable, lady version of Tony, his better half shall we say. Other than the revelation that was Toni’s gift, this issue was quite slow. We followed Chow and Toni on a mission to seek revenge on his rival chef and paint thief, Cremini. The pace was addressed, however, in the comments section claiming it to be ‘the calm before the storm’ and I for one believe them! By the end of this issue and thinking back to the previous story arc’s, you begin to realize that Tony has built up a seemingly impossible to beat number of enemies. He’s got everything from ‘vampires’ to his own kid willing to go after him. There’s no way this is going down quietly. Despite it’s slow rate there were still a great number of laughs to be had. The flavoured painting auction with the battle between Chow and a rival chef was to die for, I don’t think I’ve laughed that hard at someone giving the finger in awhile! And as per usual, you can expect some subtle and foolish background poster’s from Guillory that are sure to keep you paying attention. Revenge is a dish best served cold and there is no place this seems more true than Chew comics. No one is safe, but, they are all seemingly unaware. This is a recipe for a delicious, in your face, action packed, gruesome future for Tony and his friends and I’m sure it will be fun for all (on this end of the story at least). 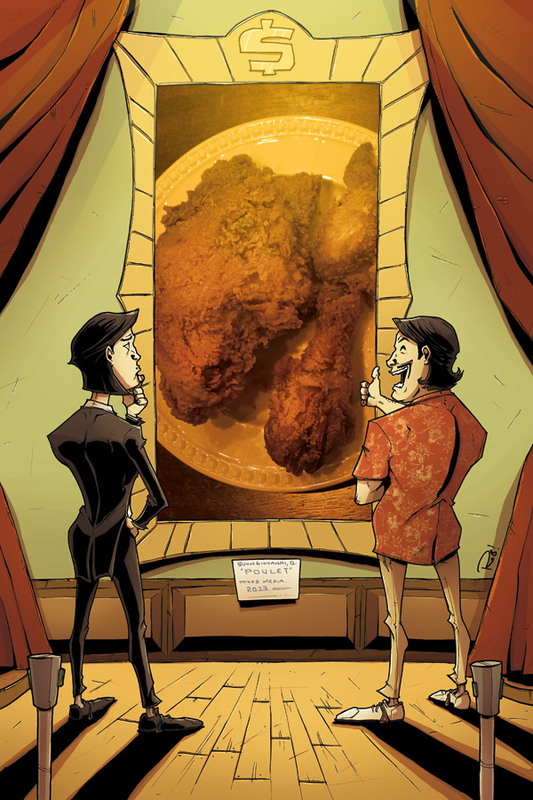 Officially half way done and winning award after award for the consistently well crafted stories Layman and Guillory push out, it is a wonder if you aren’t already reading Chew. If you are one of those people, I encourage you to pick up the first trade at the very least. You’ll be hooked from the start and if not, it was only 10 bucks.